1. You don't really need or want the item. Because I consider shopping (even online shopping) with children to be mild torture, things often sit on my "to buy" list for weeks or months on end before I go to the store, by which time I often discover that the item that I once thought was essential is actually entirely unnecessary. It is not unusual to decide that I don't really need or want half of the items on my shopping list. 2. You already own something which will serve the same purpose. For a long time I had cloth napkins on my to buy list. We had a few, but we really needed more, and I kept meaning to buy some. Then one day while cleaning out my garage, I found a bin that contained never used linens (wedding presents! ), including... cloth napkins. 3. Your neighbor owns the item you want and is willing to lend it to you or even give it to you. While admiring a neighbor's bird feeder, I remarked that I've been meaning to purchase one myself. He immediately went to his garage and brought me back two. He told me he was always picking up stuff like this at the flea market and was happy to give them to me. I acquired a bread machine the same way: I mentioned to my sister I was looking for one on Craig's List and she gave me a practically unused one that she had been storing on top of her fridge. Mention to friends and family that you are thinking of buying a book or appliance, and one might just land in your lap for free. For years I thought about buying a food processor, but then realized there were only a few occasions a year when I really wished I had one. So instead of buying one, I found a friend who has one who will let me come over and use it every once in a while. If you need a tool or other item for the short-term but don't have a neighbor who can lend one to you, you could also try to rent the item instead of buying a new one. 4. You can find the item cheaper on Craig's List or in a thrift store. This is something that even I, a regular and enthusiastic second-hand shopper, need to remind myself of. Before purchasing new, ask yourself: Is this something I could probably find second-hand? Some things are really easy to find second-hand (ride-on toys for the backyard; lawn mower; bookshelf). If you find you need such an item, give yourself a little time to watch Craig's List or to stop by a thrift store before buying new. Imagine taking everything you own out of your house, displaying it on your lawn, taking a photo of it, and then creating an itemized list of all your possessions. 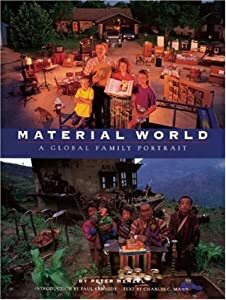 This is the essence of the amazing book Material World: a Global Family Portrait, which compares the possessions of ordinary folks from all over the world. It is a very sobering and enlightening read. Even the American family (the book was published in the 90s) owns so much less than I do, it's just embarrassing. Imagine packing up everything you own and moving it. I've moved 5 times in the last 6 years. There is nothing like moving to make you never want to buy a single thing ever again. Before buying something, ask yourself whether you would be willing to pack and move this item in a few months if you were to have to move suddenly into a smaller place on the other side of the country. What tricks do you have for being a more conscious consumer? We have What the World Eats (a junior version of Hungry Planet) by the same author/ photographer team too, which I also absolutely love! Shows photos of what families all over the world eat in a week. We love the Children's Orchard for second hand toys. I use a mix of essential oils or vinegar to clean them. It not only saves me $ as a SAHM but I an reducing my plastic footprint by buying secondhand waffle blocks or board games. Great idea! I find that when I subconsciously do this and go back to the store later I often end up not wanting it or seeing something about it that is no longer desired. Which is why last weekend when I saw a gorgeous handcrafted necklace at the farmer's market I had to talk myself out of going back to get it later in the day. I knew that I would either forget or decide it was too much effort to walk back and find it because I really wanted it. I convinced myself to buy it up right then and there. I justified it by saying I supported a local artist. Ooops.